Excursion - Benvenuti su poggiodisole! For the couple we organize many activities that help you discover the area, the sea, respect for the environment and fun. One of the most fun things to do in the sea is a natural snorkeling excursion, defined by us as an experience in the midst of nature. A boat will take us slowly to the chosen area of the sea for our excursion, allowing us to observe and learn more about the coast and shores of the island. Besides being fun and stimulating, kayaking gives you the oportunity to see beautiful hidden beaches and coves of the island where you can swim in cristal clear waters and to master the main skills of sea kayaking techniques. Our guides will let you experience the thrill of the underworld, the allure of the past and the poignant memory of the men who lived it, they will lead you through the underground roads of the Ginevro Mines. The "Regali Rurali" dairy farm breeds, grows and transforms its products using sustainable processes, blending innovative techniques to vital agricultural traditions, trying to renew them with coherence and intelligence, restoring places that have been abandoned for more than fifty years, with respect for the territory. Visit the old town accompanied by an expert guide. During the tour you can rediscover the history of the town of Portoferraio from its Roman origins up to the present day. An important stage of the guided tour wil be the one dedicated to Forte Falcone (recently renovated architectural complex) and to the house of Napoleon. The nature walk, even barefoot, is recommended for those who love quiet places and nature and for all those who have a passion for photography. Our guides will take you along the trails of the Tuscan Arcipelago National Park. Not to be missed is the walk among the dunes of Lacona. 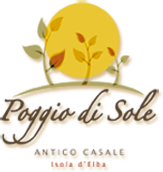 At Poggio di Sole we cultivate well-being, here and now, through places and activities dedicated to “feeling well” linking together the territory and the individual person. Starting from the relaxation platform with a breathtaking view, you can relax in the warm water of a hot tub and let yourself be inebriated by the tasting of local products at kilometer zero. In the Yurt, you can receive a relaxing massage of 30 or 60 minutes. This typical tent used by the nomadic people of Mongolia will immerse you in a dimension that is hushed and relaxing. Inside the Yurt we also organize yoga sessions and classical music concerts.